There are some important things to keep in mind when planning for your workshop. Whether your hobbies include small construction projects, repairing a vintage car or building model airplanes, we can help you design the structure that will fit your lifestyle perfectly. Once you decide that you want a dedicated workshop, we’ll help you determine what size will work best and what options will suit the workshop’s functions. 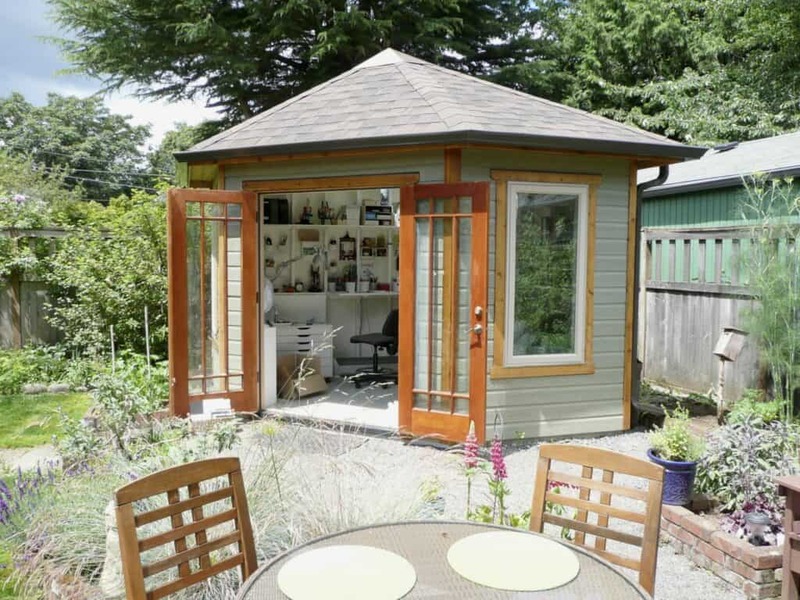 Check our post on garden sheds for more workshop ideas. Location – From a practical standpoint, it is wise to locate your workshop close to your home. You want it to be an extension of your home yet far enough away from the hustle and bustle of your everyday life. If you’re going to outfit your workshop with plumbing and/or electricity, then you have to physically situate it close to power and water lines. Aesthetics are important: you may choose to highlight your structure by making it the center of attention (which is fine) or blend it in to your landscape and make it a secret hideaway. Your choice! You’ll also want to think about natural light and ventilation (although we can provide vents for your building) and how these things will affect what you’re using the building for. Consider also the location of your building in different seasons. The surrounding foliage, as well as weather can be very different from one season to the next and may influence how and when you decide to use your workshop. Once you have decided on a size (see choosing a size below), it’s a good idea to physically stake it out on your property to ensure that the fit is comfortable for you and is harmonious with your surroundings. Zoning – Decisions made on the size, location, and style of your workshop are not entirely in your hands. Be sure to check with your local municipality to ensure that you are meeting any zoning and permit requirements. Generally, if your structure is under 100 sq. ft. you will not require a permit however, there are usually some restrictions such as a two or three foot set back from a property line to contend with (please see permits and zoning for more information). Grade – Ideally your site should be level, with a slight pitch towards the rear. This will allow drainage of water without having to excavate around your structure. A structure may be located where the ground slopes more steeply (i.e. greater then 12” from one side to the other) however, if this is the case more thought should be put to the foundation you are going to build. Try to avoid positioning a structure at the bottom of a hill, however – if you do, ensure that you beef up the drainage with a gravel bed around your structure or some other appropriate foundation. If there is a slope and you are planning to store wheel barrels and lawn mowers, be sure to consider adding a ramp to your shed. Our broad range of workshop styles, sizes, and options will allow you to design and build your workshop for functionality without having to compromise on style. Be sure to spend sufficient time browsing our photo galleries and you will benefit from all the designs that others have come up with before you. Choose a style that reflects your personal taste and fits in to the landscape. Don’t worry about your workshop matching your house, not everything needs to match…and why not be a little eclectic! You can customize your workshop to your heart’s content, implementing your personal flair along the way. Most of our workshop styles are differentiated primarily by roof lines (i.e. gable, salt box) so this is an important consideration. It’s important from the beginning of your decision making process to think about the interior design of your workshop. If you require space to work on projects that need a table, be sure to design around that. Incorporate shelving to store things and enough wiggle room to keep comfy. Store large items in the roof (if you have a gable roof) or hang them from the rafters, and leave enough space to use for your larger projects. Partition the building (storage on one side your projects on the other), that will help you keep focused and incorporate large doors and windows for light and access. We have oodles of options to choose from so you shouldn’t have much trouble achieving a good fit to your tastes and needs. It’s smart to think about how you may want to cultivate the landscape in your workshop’s immediate surroundings. Shrubs, flowers, and vines on trellises can be a nice complement to a space and will help to define it. Many people will also choose to lay flagstone or other pavers to create a pathway to their building. A little garden décor will also help to create a tranquil space. 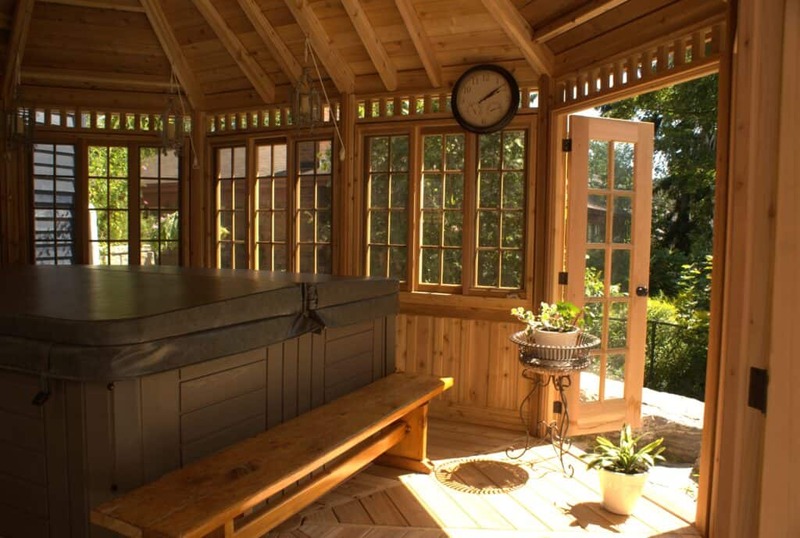 Strategically placed, things like trellises, pergolas, cupolas, lights, wind chimes, wheelbarrows, birdhouses – and even your favorite piece of weathered outdoor furniture can go a long way to creating that outdoor sanctuary your workshop creativity requires. There is no easier answer when trying to come up with the perfect sized workshop. There is no wrong choice so, you can’t really make a bad decision, and we offer a wide range of sizes so all you need to do is pick one that works. Clearly, the key is to ensure that your workshop is large enough for its intended purposes, while remaining proportional to the setting. Think of what is going to go inside and how much room is required for you to work. An easy way to do this is to physically map the location out. Think of the space you work in now and what it lacks. Partition walls may be worth considering if you want to separate contents or activities. If you intend on combining storage needs with work space, make sure to allow for enough room. A dual purpose building doesn’t have to be massive, providing you assign different uses to different spaces and incorporate some thoughtful and inventive design into your plan. Once you’ve decided on a size, place stakes in the ground and outline the sides with a string or garden hose. Adjust the stakes until you’re happy with the size and record the dimensions. Note: if you choose an inward opening “D’ series door, you will need to have four feet of clearance inside your workshop. Again, be sure to check with your zoning office for any municipal laws that may require you to have a permit before you build a structure of a certain size. Better safe than sorry! Here are some details on the materials and construction methods you can expect with your Summerwood Workshop kit. Sheathing: We use sq. edge 4 x 8 x 3/4” T & G sheets. You may want to upgrade to fir plywood, or consider a T & G pine for a different look. Joists: We use 2 x 4 spruce (with perpendicular 2 x 6 (or greater) P.T. runners underneath). Although not necessary, some people prefer to go with P.T. for the floor joists as well. We use 2 x 6 spruce for our larger workshops. Shingles: We offer cedar shingles that can be purchased for your structure at the time of sale, but there are other choices that may be purchased from your local hard supply store (asphalt shingles, for example). Whatever you choose, be sure to follow the installation instructions closely. Please refer to the roofing section on our website for more information. We generally use four types of siding in the production of our products: cedar channel siding, cedar log siding, cedar shingle siding and Canexel wood fiber siding. The cedar siding is 8” wide western red cedar channel siding with either the rough or smooth side out. It covers 6 3/8” per row and is a lovely material that looks beautiful on every design. The cedar shingles are 18″ in length and 7/16″ thick, they give a truly distinct look to the building that they’re put on. The Canexel wood fiber siding is 1” x 12” and it covers approximately 11” per row. It has a 15-year warranty and comes in a compelling range of colors with virtually no required maintenance. Studs: We use at least 2 x 4 spruce studs every 16″ OC. If you love cedar, consider upgrading. Sheathing: We use 4 x 8 x 7/16″ OSB. You may want to upgrade to fir plywood, or consider a T & G pine or cedar for a more finished appearance. Trusses and rafters: We use spruce (dimensions vary depending on size and style). Cedar may be used as an upgrade. For detailed information on our roofing choices please click here. Build your Workshop on your own or Hire a Contractor? Decide on whether you’re going to take on the project of building your structure yourself or if you’re going to hire someone to do it for you. Most of our customers tackle the project themselves and quite enjoy it; a form of therapy or family bonding if you will. Get your friends and neighbors involved, basically anyone who’s going to be spending time in your house or backyard is fair game. If you are an accomplished ‘do-it yourselfer’, or are ready to make your debut, make sure that you have both the time and the energy required for the task at hand. If not, be sure to have a look at our ‘how to hire a contractor’ package. For detailed information on assembly and the tools required for the assembly of your workshop, please click here. Style is a very personal issue. That’s why at Summerwood we offer choices. Remember all our workshop styles can be customized to your personal requirements. They range in size from as small as you want to as big as you like. The most popular sizes are the ones that are nudging 100sq. ft. In some municipalities sizes greater than this may require a permit. The Glen Echo Workshop – Our Glen Echo kit combines high-quality craftsmanship with modern design. Its functional design features a steep roof overhang for extra storage and a porch feeling. A dormer adds a nice touch to this style. The Palmerston Workshop – The Palmerston gable roof design is our most basic and most popular style. Roof trusses double as storage space for items that need to be tucked away. The Bar Harbor Workshop – This is an ideal style for those who are in the market for something eclectic. The saltbox style roof features exposed cedar rafters and 1 x 6 cedar roof boards. The Telluride Workshop – Our Telluride is defined by its steep roof pitch and rugged natural good looks. This spacious design is ideal for both storing and working with tools. It can come all dressed up with large double doors, antique hardware, vertical cedar siding and country quaint windows. The Highlands Workshop – The simple gable roof evokes the no nonsense style of the hearty northern Scots. Consider large sash windows to allow for plenty of sunlight, a Scottish rarity! The Copper Creek Workshop – The hip roof style creates a soaring feeling of space and makes for a pleasant view from any angle. Building a new garage is a significant undertaking. Interestingly enough, most of the choices you make come from answers to basic questions you’ll need to ask yourself before getting started. The first tip you’ll find here is to get our designers involved early in the planning stage of your garage. But the first question? What will you be using your new garage for? Is your new garage strictly for parking the car? How many cars? 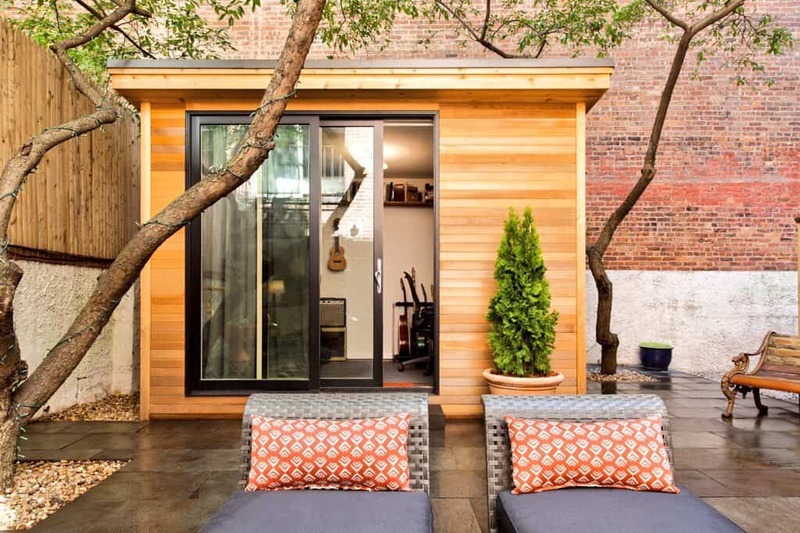 Will it be a part-time workshop, tool shed, or do you want a loft with some office space? With so many possible uses, it’s a good idea to list all the purposes your new garage will serve before beginning its design. The following tips and ideas are aimed at helping you think of all the little things in the beginning, when they are free, instead of discovering them during, or worse still, after construction. Both practical and aesthetic considerations play roles in your decisions. How far from the road, and your home, do you want your garage to be? If you live in a colder climate, do you want to be shovelling your way out to the road, or trudging your way through to the house? If you’re building your garage to complement other buildings on your property, think about how it will look in winter, spring, summer and fall. Seasonal changing foliage affects visual impact. What about running electricity, venting and plumbing to your garage? If you’re planning on doing so, you’ll need to account for these factors when choosing the location and plan to extend the infrastructure for them. If you live in a colder climate like us up here in Toronto, consider installing radiant floor heating in the building phase to keep your vehicle cozy and warm on frigid nights. 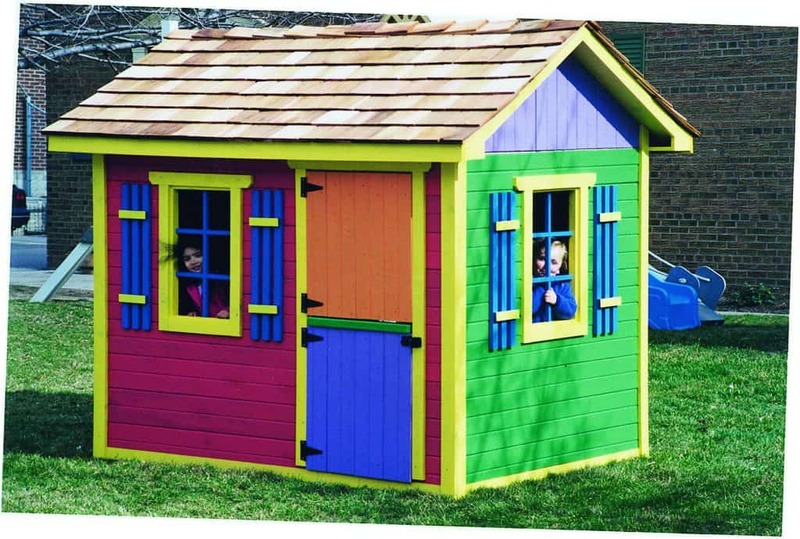 We also offer thermal doors and windows to help keep your toys warm in the winter and cool in the summer. Summerwood offers a large selection of garage designs, each of which can be personalized to suit your particular needs and wants. Many of the design options Summerwood offers are only available here; its part of what makes dealing with Summerwood unique. We’d also suggest that you involve our design team in your decision making process; they’ve been doing this for decades, and you’ll increase the odds of getting exactly what you want. Outside – Most garages do adequate duty as a shelter for your car. But a Summerwood garage is an architectural statement and can greatly boost the overall value of your property. You can make that statement an original one by modifying any of the fine garage styles we offer. Build the garage of your dreams with attractive windows and doors, enhanced by shutters and flower boxes; give it charm with antique style hardware, dormers and more. You’ll also have plenty of choices when it comes to the roofing style and material, as well as the siding. We offer maintenance free Canexel siding, as well as traditional and beautiful cedar siding. Will you be creating a concrete driveway, or using crushed stone or other material? The look of the driveway should be part of the overall design decision. What’s happening on the inside? The list you’re going to make of your garage uses will help you decide on many of the interior design options. If it’s a multi-purpose structure, you may want to partition it for order. However, an open concept provides a feeling of space that may work well for your situation. Be sure to allow some extra space for storage, with shelving and cupboards, and if you’re planning on doing some DIY home projects, you might want space for a work bench and tools. We have an impressive range of finely crafted garage doors that are sure to suit everyone’s tastes and requirements. Looks that range from the old style country barn to a smart urban coach house. Our doors are available in either a rollup or carriage style, and are available in Mahogany, Cedar or Steel. All are available in thermal insulated as well. You can also upgrade and add windows and other extras to suit yourself and create just the look you had in mind. A garage is a major contributor to the value of your property and quality of your life. At the very least it protects your car, which, is among your most prided possessions. So you want it to be sturdy and last a lifetime. That’s why we only use the finest construction materials in our garage building kits. We advise you to do the same when completing it with personal touches. The old adage, you get what you pay for is certainly true when it comes to construction. Our garages are available with rich, long-lasting western red cedar, but you can also choose our Canexel siding. It’s a maintenance-free wood fiber siding and comes in a variety of pleasing colors. The hardware is all absolute top quality to ensure longevity. Learn more about our garage siding and other building materials. At this stage, that list of intended uses we keep talking about will come in handy. For instance, if you want to host jam sessions without moving the car outside, you’ll need more space. Mind you, a dual-purpose garage doesn’t have to be huge, if you plan well. You can store skis, garden tools, lumber and the like up in a loft. But will you need extra floor room for another car, bikes, maybe a workbench, hobbyhorse or workout space? The key is to anticipate your needs and give yourself a bit of extra room to move around once you’ve accommodated them. Be sure to view our sample floor plans and utilize our floor plan grids. They’re a huge time-saver. Once you’ve decided on a size, physically test it. Set some stakes in the ground and tie string around them, creating the actual area you’re intending to use. (You can do this even if you haven’t quite decided where to put your garage.) Once your mock space is “built”, can you fit everything you’re dreaming of? The last thing you want is to find out after you’ve built your garage is that you don’t have the space to accommodate all your stuff. An important size related topic is building permits. Make sure you enquire with your local building permit office about the process for your location. Most jurisdictions and municipalities require building permits for structures over 100 sq feet, which your garage is most likely going to be, so plan on getting one long before your garage kit arrives. This library of US regional listings will include the government office you need to contact in your area. Contact us for more information. We can help. 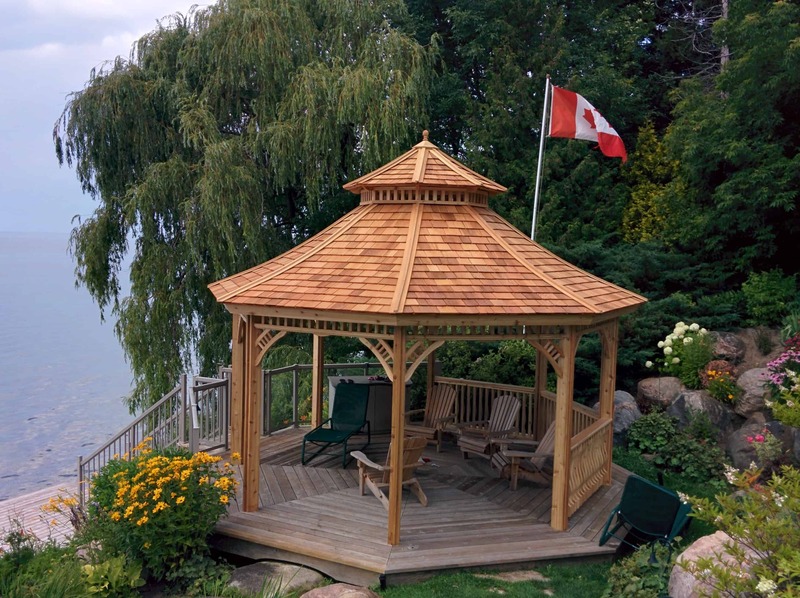 Unless you order our long-lasting and beautiful cedar shingles with your Summerwood garage kit, you’ll need to supply your own roofing. The most economical and common choice is asphalt shingles. They come in assorted and attractive colors, are easy to find at your local building supply center, and are easy to install. Another attractive yet practical choice is corrugated metal instead of shingling. It also comes in many charming colors. And in winter, even the wettest, stickiest snow falls from it like water. Depending on your design goals, you may want to obtain the same roofing material that was used on your house; in this case we can ship your garage kit with no shingles. For more information on roofing options, check out our garage information section. Another attractive yet practical choice is corrugated metal instead of shingling. It also comes in many charming colors. And in winter, even the wettest, stickiest snow falls from it like water. For more on roofing options, check out our garage information section. A garage is a relatively large project, but our prefabricated kits make it easy; plus you get loads of helpful and instructional tools, not to mention telephone and email support for those particularly tough questions. So yes, you can build it on your own. And it’s actually a lot of fun! Over the years we’ve turned loads of Nervous Nestors and Nancies into Handy Harries and Hildas! Just be sure that you have the time, energy, tools and the skill level to complete the project; don’t forget that a garage is a larger structure and requires a certain amount of carpentry skills. To give you a better idea of the time that it might take to build your garage kit, look for the installation time in the instruction paperwork. Here you’ll find the number of labor hours it would take to assemble your kit. Depending on your level of handiness, you can plan your garage’s construction better. On the other hand, you may not have the time or desire to do it yourself. We can help with our how to hire a contractor information, as it offers a lot of valuable advice. The printable labor estimate sheet will give your contractor all he or she needs to provide you with a quote. Don’t have a contractor? We can provide you with a reputable and trustworthy contact with experience building our structures. Contact us for details. Each of the below garage styles are available in an easy-to-build precut, or prefabricated kit package. They can be as large or small as you like. Choose a style, then customize it online in our Custom Design Center, or give us a call to have a designer help. Urban Garages - The Urban garage provides all the storage space you’ll ever need and does it in a style that’s all it’s own. With so much great space, you’ll be sure to use your garage for more than just parking the family car! Highlands garages – The simple gable roof evokes the no-nonsense style of hearty northern Scots. Consider large sash windows to allow for plenty of sunlight, a Scottish rarity! Archer garages – The hip roof style creates a soaring feeling of space and makes for a pleasant view from any angle. A flagstone walkway to the side door gives it that homey feel. Montcrest garages – Its steep gable roof means extra storage potential and quicker tumbling snow in winter! Inside the effect is spacious – consider capping your Montcrest with our cedar shingles. Alpine garages – Inspired by the roomy chalets of Austria and Switzerland, the double-car Alpine boasts a vast gable roof. Add a dormer window to make the most of the effect inside and out. Bishop garages – The pyramid shaped hip roof of the double-car Bishop adds a classic style to any property, bespeaking harmony and order. Balance it with our cedar shingles for a handsome look. York garages – The plunging gable roof of the double car York garage seems to go on forever inside, but gives the impression of hugging the property outside. And there’s plenty of storage potential inside the loft. Can’t make up your mind? Don’t forget our designers are waiting for your call. We’ll help you create something brand new, or we can help modify one of our existing designs to suit your situation; just contact us to get started. And did we mention we also make sheds and pool cabanas?